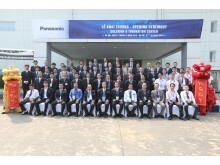 Hanoi, Vietnam, 7th October 2016 - Panasonic Corporation announces today on its opening of the “Panasonic Solution & Innovation Center Vietnam” in Hanoi. The center is established as the company’s Factory Automation (FA) showroom in Southeast Asia, aimed at showcasing highly-efficient manufacturing technologies and equipment. In today’s highly digitised world, demand for smart phones, wearable devices and other electronics are expanding rapidly. Within those electronics products, built-in printed circuit board is a necessity and plays an important role. “Panasonic Solution & Innovation Center Hanoi” showcases the company’s suite of manufacturing technologies such as auto-insertion and surface mount machines, which are designed for insertion and mounting of electronic components in high-density printed circuit board. 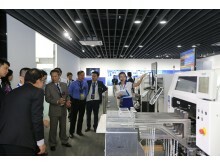 This innovation center features not only Panasonic’s latest chip mounter and welding machine, but also peripheral equipment from other partners which include component tower and inspection machines. This synergy highlights the importance of network compatibility and technological interconnectedness; and their contribution to the success of Industry 4.0 and IoT-supported manufacturing line. 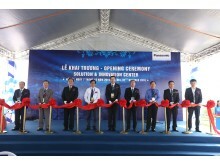 This innovation center is operated and managed by Panasonic Vietnam Factory Automation Group. At the “Panasonic Solution & Innovation Center Vietnam”, customers can experience actual manufacturing process of printed circuit board and welding machines by bringing their own materials and electronic components for trial production. The center is also equipped with a seminar hall and conference room to facilitate technical seminars and events relating to factory automation. Through these approaches, the center aims to maximise its value for customers. Panasonic already opened the showrooms in Chicago (USA), Bangkok (Thailand), Jakarta (Indonesia) and Munich (Germany). The series including the Vietnam center will be in the pipeline as the company expands its factory solution business globally. Main exhibits Chip mounter, Odd-shape component insertion machine, Screen printer, Inspection machine, Welding machine, etc.